This article is about the ancient people. For the modern group, see Aramaean identity. For other uses, see Aramean (disambiguation). The Arameans (Aramaic: ܐܪ̈ܡܝܐ‎, ʼaramáyé) were an ancient Northwest Semitic Aramaic-speaking tribal confederation who emerged from the region known as Aram (in present-day Syria) in the Late Bronze Age (11th to 8th centuries BC). They established a patchwork of independent Aramaic kingdoms in the Levant and seized tracts of Anatolia as well as briefly conquering Babylonia. The Arameans never formed a unified state but had small independent kingdoms across parts of the Near East, (present-day Syria, Lebanon, Jordan, Israel, Palestinian territories, the northwestern Arabian peninsula and south-central Turkey). Their political influence was confined to a number of states such as Aram Damascus, Hamath, Palmyra, Aleppo and the partly Aramean Syro-Hittite states, which were entirely absorbed into the Neo-Assyrian Empire (935-605 BC) by the 9th century BC. In the Neo-Assyrian Empire, the Aramaeans, Chaldeans, Suteans and indigenous Assyrians-Babylonians became largely indistinguishable, as these groups were culturally and ethnically absorbed into the native populace of Mesopotamia. By contrast, Imperial Aramaic came to be the lingua franca of the entire Near East and Asia Minor after King Tiglath-Pileser III of Assyria (ruled 745–727 BC) made it one of two official languages of the vast Neo-Assyrian Empire (the other being Akkadian) in the mid-8th century BC, in recognition of the mostly-Aramean speaking population in areas Assyria had conquered west of the Euphrates and the large numbers of Arameans in Mesopotamia. This empire stretched from Cyprus and the East Mediterranean in the west to Persia and Elam in the east, and from Armenia and the Caucasus in the north to Egypt, Libya and Arabia in the south. The Achaemenid Empire (c. 550–330 BC) greatly spread Imperial Aramaic: north to the coast of the Black Sea and eastward to the Indus Valley. This version of Aramaic, influenced by Akkadian and later by Old Persian, later developed into the Syriac dialect of Edessa. Between the 1st and 4th centuries AD, the Arameans began to adopt Christianity in place of the polytheist Aramean religion, and the Levant became an important centre of Syriac Christianity, along with Assyria to the east from where the Syriac language and Syriac script emerged (the terms 'Syria' and 'Syriac' being etymologically, geographically and historically derived from 'Assyria'). Use of the Western Aramaic language has steadily declined in the face of Arabic since the Islamic conquest of the area in the 7th century AD, and the last vestiges of the spoken tongue in and around Maalula are in danger of extinction, although Assyrian population maintain spoken dialects of Akkadian influenced Neo-Aramaic as well as Syriac as a liturgical language. Similarly, some Jewish communities and the Mandean people also retain dialects of Aramaic. Today, an Aramean identity is mainly held by a small number of largely Arabic-speaking Syriac Christians in south-central Turkey, in Syria, and in the Aramean diaspora overseas. In 2014, Israel recognized the Aramean minority, an Arabic- and Aramaic-speaking Christian community. Basalt funeral stele bearing an Aramaic inscription, c. 7th century BC. Found in Neirab or Tell Afis (Syria). The toponym A-ra-mu appears in an inscription at the East Semitic speaking kingdom of Ebla listing geographical names, and the term Armi, which is the Eblaite term for nearby Idlib (modern Aleppo), occurs frequently in the Ebla tablets (c. 2300 BC). One of the annals of Naram-Sin of Akkad (c. 2250 BC) mentions that he captured "Dubul, the ensí of A-ra-me" (Arame is seemingly a genitive form), in the course of a campaign against Simurrum in the northern mountains. Other early references to a place or people of "Aram" have appeared at the archives of Mari (c. 1900 BC) and at Ugarit (c. 1300 BC). However, there is absolutely no historical, archaeological or linguistic evidence that the Aramu, Armi or Arame were actually Arameans or even related to them; and the earliest undisputed historical attestation of Arameans as a people appears much later, in the inscriptions of Tiglath Pileser I (c. 1100 BC). Nomadic pastoralists have long played a prominent role in the history and economy of the Middle East, but their numbers seem to vary according to climatic conditions and the force of neighbouring states inducing permanent settlement. The period of the Late Bronze Age seems to have coincided with increasing aridity, which weakened neighbouring states and induced transhumance pastoralists to spend longer and longer periods with their flocks. Urban settlements (hitherto largely Amorite, Canaanite, Hittite, Ugarite inhabited) in The Levant diminished in size, until eventually fully nomadic pastoralist lifestyles came to dominate much of the region. These highly mobile, competitive tribesmen with their sudden raids continually threatened long-distance trade and interfered with the collection of taxes and tribute. The people who had long been the prominent population within what is today Syria (called the Land of the Amurru during their tenure) were the Amorites, a Canaanite speaking group of Semites who had appeared during the 25th century BC, destroying the hitherto dominant East Semitic speaking state of Ebla, founding the powerful state of Mari in the Levant, and during the 19th century BC founding Babylonia in southern Mesopotamia. However, they seem to have been displaced or wholly absorbed by the appearance of a people called the Ahlamu by the 13th century BC, disappearing from history. Ahlamû appears to be a generic term for a new wave of Semitic wanderers and nomads of varying origins who appeared during the 13th century BC across the Near East, Arabian Peninsula, Asia Minor, and Egypt. The presence of the Ahlamû is attested during the Middle Assyrian Empire (1365–1020 BC), which already ruled many of the lands in which the Ahlamû arose, in the Babylonian city of Nippur and even at Dilmun (modern Bahrain). Shalmaneser I (1274–1245 BC) is recorded as having defeated Shattuara, King of the Mitanni and his Hittite and Ahlamû mercenaries. In the following century, the Ahlamû cut the road from Babylon to Hattusas, and Tukulti-Ninurta I (1244–1208 BC) conquered Mari, Hanigalbat and Rapiqum on the Euphrates and "the mountain of the Ahlamû", apparently the region of Jebel Bishri in northern Syria. The Arameans would appear to be one part of the larger generic Ahlamû group rather than synonymous with the Ahlamu. Funeral stele of Si` Gabbor, priest of the Moon God. Basalt, early 7th century BC, found in Neirab (Syria), bears an Aramaic inscription. The emergence of the Arameans occurred during the Bronze Age collapse (1200–900 BC), which saw great upheavals and mass movements of peoples across the Middle East, Asia Minor, The Caucasus, East Mediterranean, North Africa, Ancient Iran, Ancient Greece and Balkans, leading to the genesis of new peoples and polities across these regions. The first certain reference to the Arameans appears in an inscription of Tiglath-Pileser I (1115–1077 BC), which refers to subjugating the "Ahlamû-Aramaeans" (Ahlame Armaia). Shortly after, the Ahlamû rapidly disappear from Assyrian annals, to be replaced by the Aramaeans (Aramu, Arimi). This indicates that the Arameans had risen to dominance amongst the nomads; however, it is possible that the two peoples had nothing in common, but operated in the same area. By the late 12th century BC, the Arameans were firmly established in Syria; however, they were conquered by the Middle Assyrian Empire, as had been the Amorites and Ahlamu before them. The Middle Assyrian Empire (1365–1050 BC), which had dominated the Near East and Asia Minor since the first half of the 14th century BC, began to shrink rapidly after the death of Ashur-bel-kala, its last great ruler in 1056 BC, and the Assyrian withdrawal allowed the Arameans and others to gain independence and take firm control of what was then Eber-Nari (and is today Syria) during the late 11th century BC. It is from this point that the region was called Aramea. Some of the major Aramean speaking kingdoms included: Aram-Damascus, Hamath, Bit Adini, Bit Bahiani, Bit Hadipe, Aram-Bet Rehob, Aram-Zobah, Bit-Zamani, Bit-Halupe and Aram-Ma'akah, as well as the Aramean tribal polities of the Gambulu, Litau and Puqudu. Later Biblical sources tell us that Saul, David and Solomon (late 11th to 10th centuries) fought against the small Aramean kingdoms ranged across the northern frontier of Israel: Aram-Sôvah in the Beqaa, Aram-Bêt-Rehob (Rehov) and Aram-Ma'akah around Mount Hermon, Geshur in the Hauran, and Aram-Damascus. An Aramean king's account dating at least two centuries later, the Tel Dan Stele, was discovered in northern Israel, and is famous for being perhaps the earliest non-Israelite extra-biblical historical reference to the Israelite royal dynasty, the House of David. 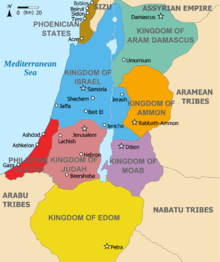 In the early 11th century BC, much of Israel came under Aramean rule for eight years according to the Biblical Book of Judges, until Othniel defeated the forces led by Chushan-Rishathaim, the King of Aram-Naharaim. Further north, the Arameans gained possession of Neo-Hittite Hamath on the Orontes and were soon to become strong enough to dissociate with the Indo-European speaking Neo-Hittite states. During the 11th and the 10th centuries BC, the Arameans conquered Sam'al (modern Zenjirli), also known as Yaudi, the region from Arpad to Aleppo, which they renamed Bît-Agushi, and Til Barsip, which became the chief town of Bît-Adini, also known as Beth Eden. North of Sam'al was the Aramean state of Bit-Gabbari, which was sandwiched between the Syro-Hittite states of Carchemish, Gurgum, Khattina, Unqi and the Georgian state of Tabal. At the same time, Arameans moved to the east of the Euphrates, where they settled in such numbers that, for a time, the whole region became known as Aram-Naharaim or "Aram of the two rivers". Eastern Aramaean tribes spread into Babylonia and an Aramaean usurper was crowned king of Babylon under the name of Adad-apal-iddin. One of their earliest semi-independent kingdoms in southern Mesopotamia was Bît-Bahiâni (Tell Halaf). Assyrian annals from the end of the Middle Assyrian Empire c. 1050 BC and the rise of the Neo-Assyrian Empire in 911 BC contain numerous descriptions of battles between Arameans and the Assyrian army. The Assyrians would launch repeated raids into Aramea, Babylonia, Ancient Iran, Elam, Asia Minor, and even as far as the Mediterranean, in order to keep its trade routes open. The Aramean kingdoms, like much of the Near East and Asia Minor, were subjugated by the Neo Assyrian Empire (911–605 BC), beginning with the reign of Adad-nirari II in 911 BC, who cleared Arameans and other tribal peoples from the borders of Assyria, and began to expand in all directions (See Assyrian conquest of Aram). This process was continued by Ashurnasirpal II, and his son Shalmaneser III, who between them destroyed many of the small Aramean tribes, and conquered the whole of Aramea (modern Syria) for the Assyrians. In 732 BC Aram-Damascus fell and was conquered by the Assyrian king Tiglath-Pileser III. The Assyrians named their Aramean colonies Eber Nari, whilst still using the term Aramean to describe many of its peoples. The Assyrians conducted forced deportations of hundreds of thousands Arameans into both Assyria and Babylonia (where a migrant population already existed). Conversely, the eastern Aramaic language was adopted as the lingua franca of the Neo-Assyrian Empire in the 8th century BC, and the native Assyrians and Babylonians began to make a gradual language shift to distinctly Mesopotamian Eastern Aramaic dialects (including the Syriac language, which evolved in 5th century BC Assyria) and still survives to this day amongst the indigenous Assyrian Christians and Mandeans of northern Iraq, southeast Turkey, northeast Syria and northwest Iran. The Neo Assyrian Empire descended into a bitter series of brutal internal civil wars from 626 BC, weakening it greatly. This allowed a coalition of many its former subject peoples; the Babylonians, Chaldeans, Medes, Persians, Parthians, Scythians, Sargatians and Cimmerians to attack Assyria in 616 BC, sacking Nineveh in 612 BC, and finally defeating it between 605 and 599 BC. During the war against Assyria, hordes of horse borne Scythian and Cimmerian marauders ravaged through Aramea and all the way into Egypt. Aramea/Eber-Nari was then ruled by the succeeding Neo-Babylonian Empire (612–539 BC), initially headed by a short lived Chaldean dynasty. The Aramean regions became a battleground between the Babylonians and the Egyptian 26th Dynasty, which had been installed by the Assyrians as vassals after they had conquered Egypt, ejected the previous Nubian dynasty and destroyed the Kushite Empire. The Egyptians, having entered the region in a belated attempt to aid their former Assyrian masters, fought the Babylonians (initially with the help of remnants of the Assyrian army) in the region for decades before being finally vanquished. The Babylonians remained masters of the Aramean lands only until 539 BC, when the Persian Achaemenid Empire overthrew Nabonidus, the Assyrian born last king of Babylon, who had himself previously overthrown the Chaldean dynasty in 556 BC. The Arameans were later conquered by the Achaemenid Empire (539–332 BC). However, little changed from the Assyrian period, as the Persians, seeing themselves as successors to the Assyrians and having spent three centuries under Assyrian rule, maintained Imperial Aramaic as the state language, together with Assyrian administrative structures, and the name Eber Nari still applied to the region. However, during the Greek Seleucid Empire (312–150 BC), when the Greeks conquered Assyria from the Achaemenids, they applied the 9th century BC Indo-European name for Assyria to that land, which read Syria, a derivative of "𒀸𒋗𒁺 𐎹" Aššūrāyu, which had hitherto only referred historically and geographically to Assyria and the Assyrians, a land and people in modern terms situated in the northern half of Iraq, north-eastern Syria, south-eastern Turkey and the north-western fringe of Iran, and not to the Levant or its largely Aramean populace (see Etymology of Syria). From the late 4th or early 3rd century BC the Seleucid Greeks also applied this name to Aram/Eber-Nari to the west of Assyria/Syria, which had been an Assyrian colony for three centuries. This caused both the Assyrians from Assyria and the Arameans to the west in Aram, to be labelled Syrians (and later Syriacs) in Greco-Roman culture, despite the two peoples being geographically, historically and ethnically distinct from one another. This confusion would continue in the Western world until modern times with the Syria versus Assyria naming controversy (see Name of Syria). The Parthian, Roman and Byzantine Empires followed, with the Aramean lands becoming the front line initially between the Parthian and Roman empires, and then between the Sassanid and Byzantine Empires. There was also a brief period of Armenian rule during the Roman Period. Between the 1st and 4th centuries AD, the Arameans began to adopt Christianity in place of the polytheist Aramean religion, and the Levant became an important centre of Syriac Christianity, along with Assyria to the east from where the Syriac language and Syriac script emerged. Syriac Christianity survives among the indigenous pre-Arab population to the present day. Arameans continued to be the majority population in their homeland (most of modern Syria and part of south-central Asia Minor) until well after the Arab Islamic Conquest of the mid-7th century AD. A number of Aramaean kingdoms sprang up in the region, the most important being Palmyra, (which for a brief period became the Palmyrene Empire, rivaling Rome). There was probably some synthesis with pre-Islamic Arab migrants in the southern deserts (and possibly Greeks and Phoenicians also). After the Arab Islamic conquest of the region in the 7th century AD, native Arameans gradually became a minority in their homelands, the language was gradually replaced by Arabic, as increasing numbers of Arabs (together with Turkic and Iranian peoples) began to move into the region. Many Syriac Christians still speak various Aramaic dialects, including a small number of Arameans who still speak the Western Neo-Aramaic language. An Aramean identity is mainly held by a number of Syriac Christians in southcentral Turkey, southeastern Turkey, western, central, northern and southern Syria and in the Aramean diaspora especially in Germany and Sweden. In 2014, Israel recognized the Aramean minority, an Arabic- and Aramaic-speaking Christian community. Arameans are mostly defined by their use of the West Semitic Old Aramaic language (1100 BC – AD 200), first written using the Phoenician alphabet, over time modified to a specifically-Aramaic alphabet. As early as the 8th century BC, Aramaic competed with the East Semitic Akkadian language and script in Assyria and Babylonia, and it spread then throughout the Near East in various dialects. By around 800 BC, Aramaic had become the lingua franca of the Neo Assyrian Empire. Although marginalized by Greek in the Hellenistic period, Aramaic in its varying dialects remained unchallenged as the common language of all Semitic peoples of the region until the Arab Islamic conquest of Mesopotamia in the 7th century AD, when it became gradually superseded by Arabic. The late Old Aramaic language of the Neo-Assyrian Empire, Neo-Babylonian Empire and Achaemenid Persian Empire developed into the Middle Aramaic Syriac language of Persian Assyria, which would become the liturgical language of Syriac Christianity. The descendant dialects of this branch of Eastern Aramaic, which still retains Akkadian loanwords, still survive as the spoken and written language of the Assyrian people. It is found mostly in northern Iraq, northwestern Iran, southeastern Turkey and northeastern Syria and, to a lesser degree, in migrant communities in Armenia, Georgia, southern Russia, Lebanon, Israel, Jordan and Azerbaijan as well as in diaspora communities in the West, particularly the United States, Canada, Great Britain and Sweden, Australia and Germany. A small number of Israeli Jews, particularly those originating from Iraq and, to a lesser degree, Iran and eastern Turkey, still speak Eastern Aramaic, but it is largely being eroded by Hebrew, especially within the Israeli-born generations. The Western Aramaic dialect is now only spoken by Muslims and Christians in Ma'loula, Jubb'adin and Bakhah. Mandaic is spoken by up to 75,000 speakers of the ethnically-Mesopotamian Gnostic Mandaean sect, mainly in Iraq and Iran. It appears from their inscriptions as well as from their names that Arameans worshipped Mesopotamian gods such as Haddad (Adad), Sin, Ishtar (whom they called Astarte), Shamash, Tammuz, Bel and Nergal, and Caananite-Phoenician deities such as the storm-god, El, the supreme deity of Canaan, in addition to Anat (‘Atta) and others. The Arameans who lived outside their homelands apparently followed the traditions of the country where they settled. The King of Damascus, for instance, employed Phoenician sculptors and ivory-carvers. In Tell Halaf-Guzana, the palace of Kapara, an Arameans ruler (9th century BC), was decorated with orthostats and with statues that display a mixture of Mesopotamian, Hittite, and Hurrian influences. ^ a b "Aramaean (people)". Encyclopaedia Britannica. ^ "Israeli Christians Officially Recognized as Arameans, Not Arabs". Israel Today. September 18, 2014. Retrieved 27 April 2015. ^ "Ministry of Interior to Admit Arameans to National Population Registry - Latest News Briefs - Arutz Sheva". Arutz Sheva. ^ Lipinski, 2000, p. 25–27. ^ The Encyclopedia Americana. International ed. (c1986) Danbury, Conn.: Grolier. ^ ^ Frye, R. N. (October 1992). "Assyria and Syria: Synonyms" (PDF). Journal of Near Eastern Studies 51 (4): 281–285. doi:10.1086/373570. Wikimedia Commons has media related to Aramaeans. Beyer, Klaus (1986). "The Aramaic language: its distribution and subdivisions". (Göttingen: Vandenhoeck und Ruprecht). ISBN 3-525-53573-2. Lipiński, Edward (2000). The Aramaeans: their ancient history, culture, religion (Illustrated ed.). Peeters Publishers. ISBN 978-90-429-0859-8.